We love all things Kinect here at TNW, and this post is the result of our fetish. Do you know what a Skyrim is? 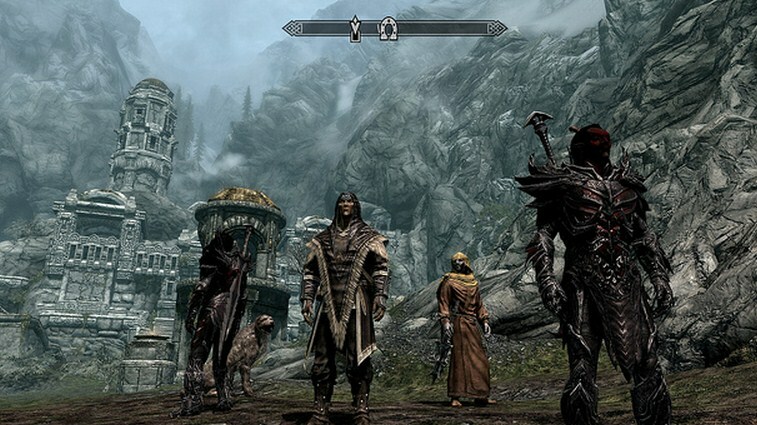 Trick question, here’s the real one: have you played Skyrim? If not, this post will be less fun. Here’s the deal: an enterprising gamer has taken several components, and built a virtual reality, motion-controlled, Skyrim experience. That tingling in your pants is your nerd cred getting all hot and bothered. I’ve setup the Sony HMZ-T1 head mounted display to use Stereoscopic 3D as well as attached the TrackClip Pro on it for head tracking. I had to place the TrackIR 5 on a wire hanging from the ceiling as it needed to be around head level to track my head movements properly. The Kinect was setup on the PC using PrimeSense’s OpenNI drivers. I used FAAST 0.9 with a custom script to map certain gestures with the keyboard, such as walking on the spot to move in the game, leaning left, leaning right, jumping and moving my right arm forward to use the sword. Shoot was used to map several speech commands with actions in the game as well, such as saying ‘Open Menu’ and ‘Close Menu’ to trigger the in-game menu, as well as using commands to navigate through the menu. All the devices to do this cost less than $1,500, although it is still not smooth and responsive enough yet for a decent gaming session. Hopefully in the near future this concept of gaming will be more refined. For the rest of today, this video is the official video of epic.